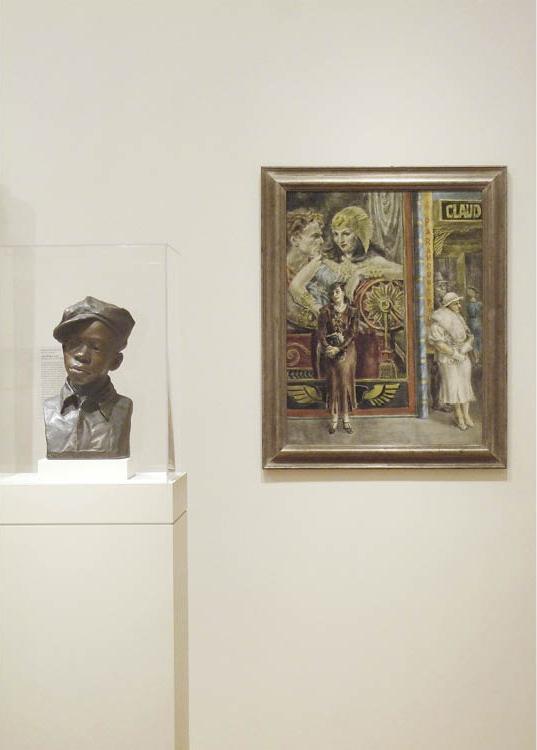 A Frame of Paramount Importance Reginald Marsh’s painting in its new frame (left, front), in its old frame (left, behind), and installed in the galleries (below). Launched three years ago in tandem with the reinstallation of the museum’s American holdings, our much-needed framing project is still going strong and generating a good deal of interest both locally and nationally. Thus far we have reframed nearly two dozen American paintings, greatly enhancing their visual and historical appeal through the process. 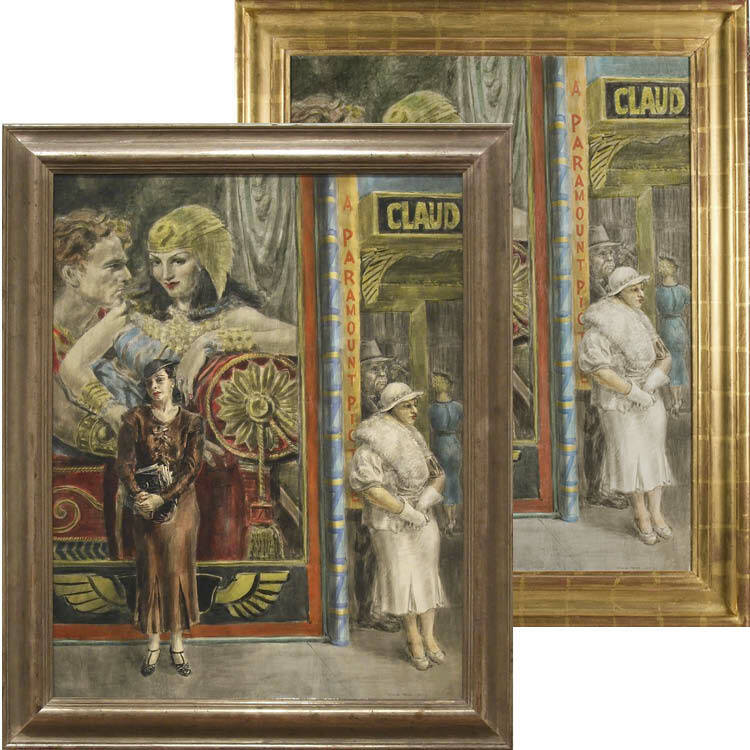 Whereas most of the paintings involved in this project date to the 19th century, some works of more recent vintage have also experienced welcome transformation, as is the case with Reginald Marsh’s A Paramount Picture, 1934. The story behind reframing this masterpiece of American Scene painting offers insight into the careful planning typically behind such undertakings. But this particular “case study” culminates with a special twist: an element of pure serendipity that confirms the old adage that it pays to be in the right place at the right time. When Marsh’s A Paramount Picture was acquired by the museum in 2006, it did not have its original frame. At some point in its history—perhaps during the mid-1980s when it changed private ownership—the painting was placed in a frame of new manufacture. In addition to being historically inaccurate, this framing choice was remarkably insensitive in terms of its oversize scale and bright golden patina. Very likely the reframing constituted a misguided attempt to “tart up” the painting’s sobering Depression-era subject and subdued palette, making it more marketable to potential buyers on the lookout for something to embellish an ostentatious décor. In terms of design, the frame was additionally inappropriate in that its clunky angularity clashed with Marsh’s dexterously executed image, which teems with lively curvilinear flourishes. Because the frame was so much at odds with the painting, it immediately earned priority status on our “to be replaced” list. To select a proper frame for A Paramount Picture, I felt it prudent to start by investigating Marsh’s own framing preferences. This was easier said than done, because detailed research into Marsh’s framing choices has yet to be initiated. Therefore, I set out on my own quest. First, I combed through Marsh’s vast personal records that are now housed at the Archives of American Art in Washington, D.C., where, at best, I hoped to unearth an old photograph depicting our painting in its original frame, or, at least, to discover information about Marsh’s frames in general. Unfortunately, neither wish was fulfilled. (However, all was not for naught, for I discovered a series of wonderful preliminary sketches for A Paramount Picture, as well as a host of fascinating material outlining its inception and creation.) While at the archives, I also examined the papers of William Benton, the noted politician, publisher, and art collector who owned A Paramount Picture for several decades until his death in 1973. Alas, this proved to be another dead end in regard to gaining insight into the painting’s original frame. Back to the drawing board. Next I decided to attempt to locate original frames on Marsh’s works of similar medium, date, dimension, subject, and mood, in order to determine if the artist preferred a particular framing design during this particular phase of his career. Thankfully, this proved to be a successful endeavor. After corresponding with curators and visiting various museums over the course of a year, I was able to identify original frames of identical style on three major 1930s paintings by Marsh in the respective collections of the Art Institute of Chicago, Columbus Museum of Art, and Smithsonian American Art Museum. This handsome and subtle frame design—which features muted and lightly distressed silver gilding, as well as a simple yet graciously curved profile—superbly complemented each painting, and I felt it would be the perfect choice for A Paramount Picture as well. Armed with photographs that I took of these framed paintings in their galleries, I approached a frame specialist in New York to discuss the possibility of having a replica made for us. See it in Gallery 228 in the east wing.